So I was walking back to my hostel in the underground shopping mall at Taipei’s Main Station and just when I was about to climb the stairs at Exit Y13 something curious caught my eye. Were those people really being hit with butcher knives? Seeing my surprise, and perhaps a look of utter horror, a man came out to me, smiled and spoke to me in Mandarin. I can’t be sure of what he said but he showed me that the blades were not sharp and then proceeded to do a little demonstration on my back. To my surprise it felt really good, especially after spending the day hiking up Elephant Mountain. So the next thing I knew a price list was shown to me and, my curiosity getting the better of me, I signed up for 30 minutes. The masseuse handed me a cup of water and asked me to remove everything from my pockets and to place my belongings in the basket below the familiar massage table that had a hole for the head on one end. 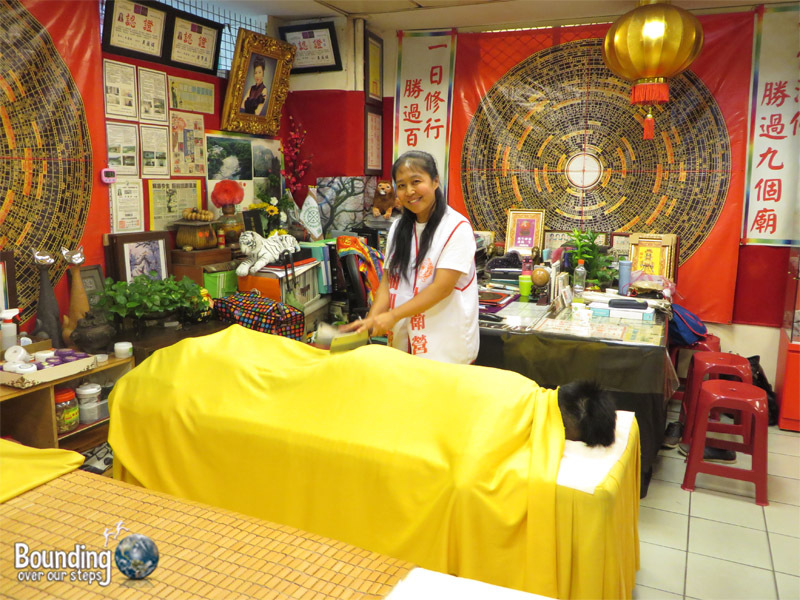 The woman began by massaging peppermint oil on the back of my neck and on my lower back and then draped a large yellow cloth over me. She started massaging me (with her hands) all over, beginning with my back, and then arms and then legs and the feet. The masseuse continued chopping me on my upper legs and then reached my calves and it was very painful, no doubt due to the amount of stairs I had climbed that day. Thinking it might be a “good pain”, I tried to breathe through it and let the knives do their job. Oh my god, is she going to chop my head too? She moved on to my feet and that was heavenly for my aching soles. But then I felt a cloth being draped over my head. She wasn’t planning to chop my head, was she? And then came the knives straight to the back of my head, which, as soon as I managed to get the image of her chopping my head right off out of my head, felt incredibly good. In fact, it became my favorite part of the entire experience. Thumbs up to the masseuse! Pretty soon, I heard a timer and the knives got put away. The woman massaged me some more like a cool down. Finally, she started slapping me all over my body as if tenderizing me. And with one final slap I knew the massage was over. I drank a little tea, paid my money and left having had a new experience. Have you ever received a knife massage? Would you try it? The way you tell this story is hilarious, I can picture you in my mind. Lying there and waiting for the final blow. Hope your hikingpains were gone? I once had a massage in Taipei, quite good, but what stood out was that the masseuse was blind. It seems that that is a widespread career direction for blind women in Taiwan. Knives were never offered. Mindy was telling me about this last week and it made me so envious! I LOVE my massages and this sounds like such a cool experience. I would actually go to Taiwan just to do this!! 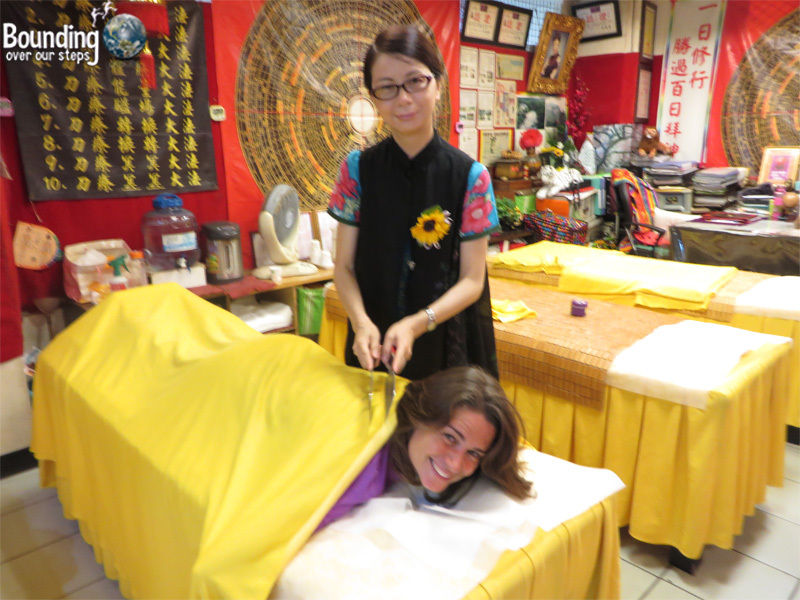 I got the most painful massage in Taipei. It was one of those ‘stepping on my back’ type. Glad it was good at the end! Ouch indeed! Did it at least feel good afterwards? Next time, try the knife massage instead. 🙂 And if you want to experience a massage where they put you in all kinds of strange positions, come to Thailand. I never knew I could bend like a pretzel. And the Bravery Award goes to …. drum roll …. Ligeia! Holy moly, knives? I’m laughing and crying at the same time. I’ve had the tenderising slaps but never knives. I love how you embrace new experiences, and share them with us. Hah! Well who’d of thunk it? What an interesting way to massage. Very cool. Now this is something I’ve NEVER heard of…but I’d be curious enough to try it. I actually just wrote a guest post on Go See Write about how I’m a spa addict and all the unique spa experiences I’ve had around the world but I’ve got to admit… I might have to pass the crown to you guys. Seriously impressive!